An Italian Wall Lizard climbs up a fallen Roman column, a scene that could have taken place at any point in the last two thousand years. 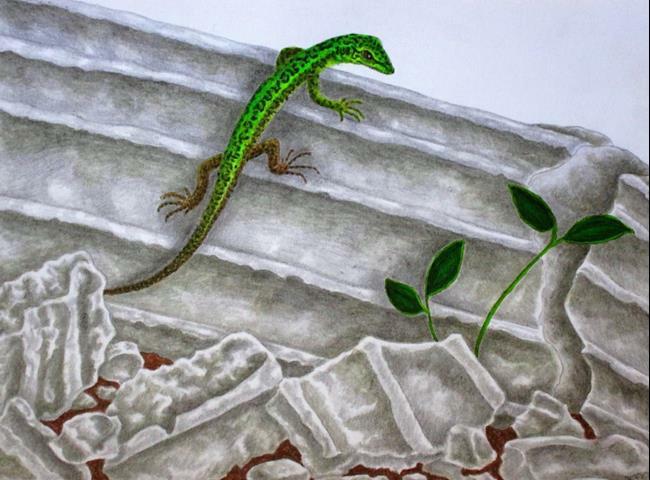 The base color of the plant and lizard was an acrylic wash, and the rest done in Graphitint pencils, which are like regular pencils with a hint of color. The texture on the column & it's pieces were fun to do, seeing how I rarely incorporate man made objects into my work. This piece won Honorable Mention at the Westlake-Westshore Arts Council Juried Show in 2017.